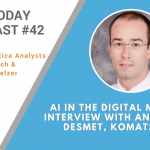 In this week’s episode of the AI Today podcast we interview Antoine Desmet, Analytics Manager at Komatsu. Many people might not realize just how much technology is involved in mining. We discuss the concept of the “Digital Mine” and how Komatsu uses Internet of Things (IoT) in combination with AI and ML to enable a large range of capabilities.